remember when i was so into headbands? but today i found this hat. and i feel like a new girl! p.s. 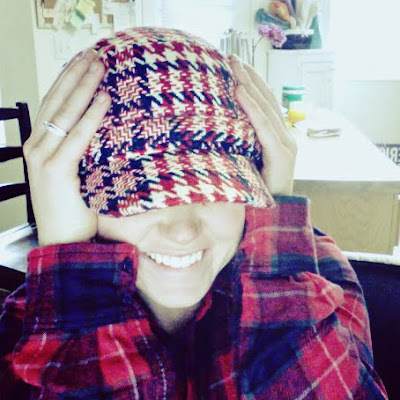 jason says i look like a lumber-jack with the hat + the shirt. (it snowed today so of course i had to wear the flannel plaid. love it!! wish i looked cute in hats! Cute hat. Did you not get the big head gene? I can't ever find a hat that fits. Ooh- I just love hats! It looks super cute! LOVE IT! Sorry Geri, but I have to agree with Jason. I acutally really like the hat. I'm just not sure about the hat/lumberjack shirt combo. I think this is a new look for you! its good, you should definatley rock it more often! i'm glad you went with the red one. and i'm glad it makes you feel like a new girl. I just think you need to be sure not to wear it pulled down so far. I'm not worried about you cutting down any trees, but I am worried about you bumping into them. Oh you are just so cute! I'm glad we got to see you guys in Utah! Isn't it sad that we live in the same town and we have to travel to Utah to see eachother haha I went private on my blog so if you want to look at ours send me your e-mail at eatoroza@isu.edu and I'll send you an invite ok! oh this is perfect... and if there is a problem with the red (which there isn't, I love it) then just buy another one! Don't worry, I went and bought one right after lunch. Good find lady.